"Athough no new Burns poem celebrating Scotland’s national game has been found in a dusty cupboard, what I have learnt is that in a copy of the Burns Chronicle of 1934 there is evidence that the Bard was a curler. 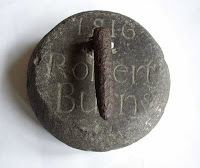 Could this have been Burns' own curling stone? Unlikely. It is certainly from the eighteen century, but the date is twenty years after his death. The stone is in David B Smith's collection.